Carson’s Crew was founded in 2014 in support of Carson Rose and his battle with arthritis. Carson, now 6, is currently in remission, so nowadays, life has returned to semi-normal, and for that, his family is grateful. But that hasn’t always been the case. Carson has been dealing with the effects of arthritis since he was 10 months old. As a baby, Carson would cry for no apparent reason. Even something as simple as crawling, are milestones that he never had. At 4 years old, activities that were deemed “normal” for other children his age, were sometimes impossible. Coloring a picture “hurt his hands.” So did building with Legos. A walk around the zoo, or even the grocery store, resulted in aching legs. Over the summer, while playing with friends, instead of enjoying his Popsicle, Carson was concerned it was going to be used to numb his arm, in preparation for his shots. You see, that became a ritual in the Rose household on Friday nights. For 4 years, shot night was the biggest reminder of this crippling disease. Though he is not currently receiving them, he continues to talk about them. Even a routine checkup at the doctor’s office is prefaced with the question, “Is my arthritis back?” There are daily reminders and struggles that he is still dealing with this disease. 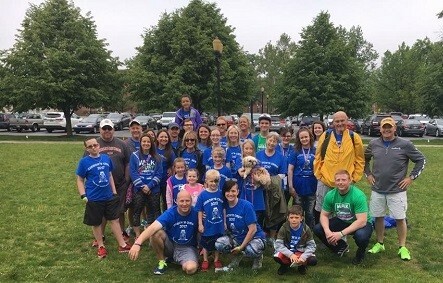 2019 will mark the 6th year that Carson’s Crew has participated in the Walk to Cure Arthritis and their team goal is $15,000! Join them this year and continue walking for a cure! You can also form a Carson’s Crew team at your local Walk to Cure Arthritis – register or donate today!